An Indian soldier was killed Tuesday when Pakistani troops fired at Indian positions on the Line of Control (LoC) in Jammu and Kashmir, the military said. JAMMU: An Indian soldier was killed Tuesday when Pakistani troops fired at Indian positions on the Line of Control (LoC) in Jammu and Kashmir, the military said. Military spokesman Col Manish Mehta told IANS here that the Pakistan Army used automatics and small-calibre weapons in Pallanwalla area of Akhnoor sector. 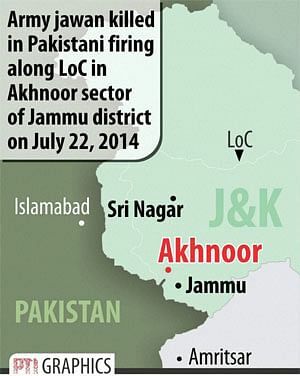 "The firing was intended to facilitate the infiltration of militants into our side of the LoC," he said. "The infiltration attempt has been foiled but searches are still going on in the area."